Every medical student must be able to take an accurate history and perform a physical examination. 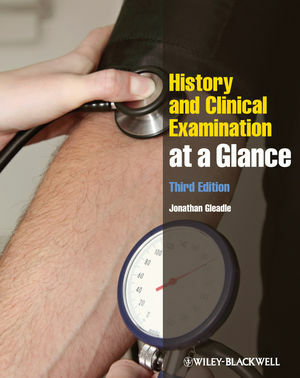 This third edition of History and Clinical Examination at a Glance provides a concise, highly illustrated companion to help you develop these vital skills as you practice on the wards. Building on an overview of the patient/doctor relationship and basic enquiry, the text supports learning either by system or presentation of common conditions, with step-by-step and evidence-based information to support clinical examination and help you formulate a sound differential diagnosis. History and Clinical Examination at a Glance is the perfect guide for medical, health science students, and junior doctors, as an ideal resource for clinical attachments, last-minute revision, or whenever you need a refresher. Jonathan Gleadle is Professor of Medicine at Flinders University and Consultant Nephrologist at Flinders Medical Centre, Adelaide, South Australia. He was formerly University Lecturer in Nephrology and General Medicine at Oxford University.